The Berkshire XL contains a Cummins ISB diesel engine, putting out 360hp and 800ft-lb of torque through an Allison 3000 transmission. 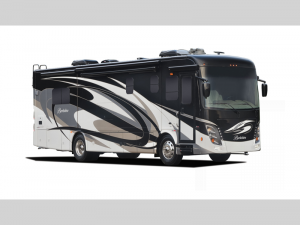 This RV features an upgraded 8.0kW Onan generator and a 10,000lb trailer hitch and offers all the amenities of a high end luxury diesel motor coach at about the same price you would find a gas motor coach. Built on a Freightliner Raised Rail XCR chassis with complete pass through storage, Berkshire’s standard features include a fiberglass roof, full body paint, electric generator slide out, automatic door and patio awnings. And that’s JUST the exterior! The interior features vinyl tile flooring that you’ll adore and residential refrigerators that will be able to contain all of your food, no problem! 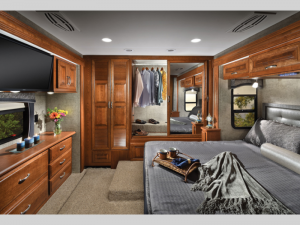 In all of the Berkshire Class A Diesel motorhome floorplans, they feature the LED TVs (size varies) to settle down in front of during rainy days, and a blu-ray DVD player that your kids will be able to enjoy their favorite movies on! This is also where you’ll be able to enjoy the Visionary hide-a-bed sofa and the optional theatre seating (varies on different models). In addition to all of those wonderful features, the Berkshire provides you with carpeted slide-outs (where applicable), window valances and bedroom carpet (with padding) to add a bit of warmth to the atmosphere. To add to the beautiful design, the Berkshire features polished solid surface kitchen/dinette countertops with flush sink and stove covers. There is décor laminate on all other countertops! As you can see, there’s no way you won’t fall in love with this beautiful motorhome! If you’re interested in taking a look at it, or have some questions, please contact us today! We love connecting with customers like you!